After the rain and drizzle of yesterday it was good to wake up to sunshine this morning, and what better way to start it than with a run?! Anyway, Rachael ran to the bridge and back, and I may not have made it that far!! The plan today was to go to the nearby town of Sintra, which necessitated an early start, but then I changed my mind! 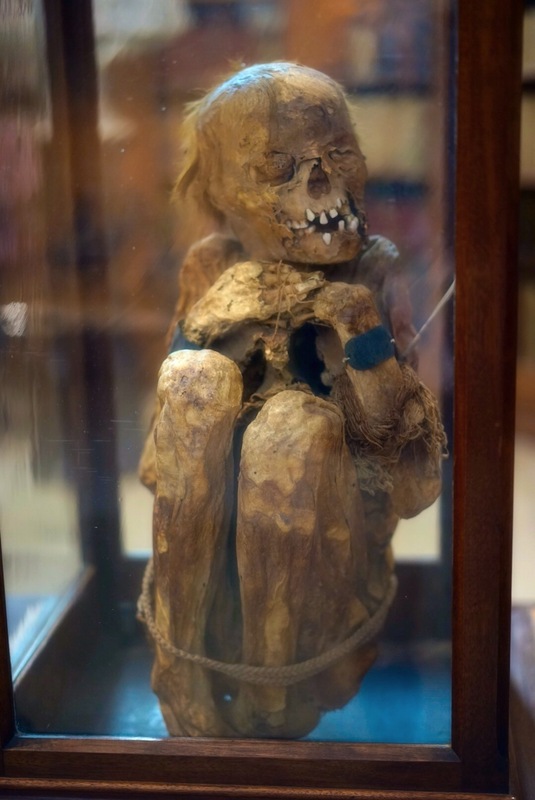 The thought of driving out of town, then back in was giving me the heebie geebies, so I gently suggested we put our plans off till tomorrow….and sorry ’bout the sleep in. So, breakfast time. Obligatory croissants & coffee, then off for more exploring. Lisbon is built on seven hills, and when I say hills, I mean HILLS! Everywhere is up, that is of course till you reach the top, then everything is down!! We seem to like walking instead of taking public transport, for some strange reason, but today we threw reason out the door. Call us crazy, but we ventured into new territory folks, and caught a tram! 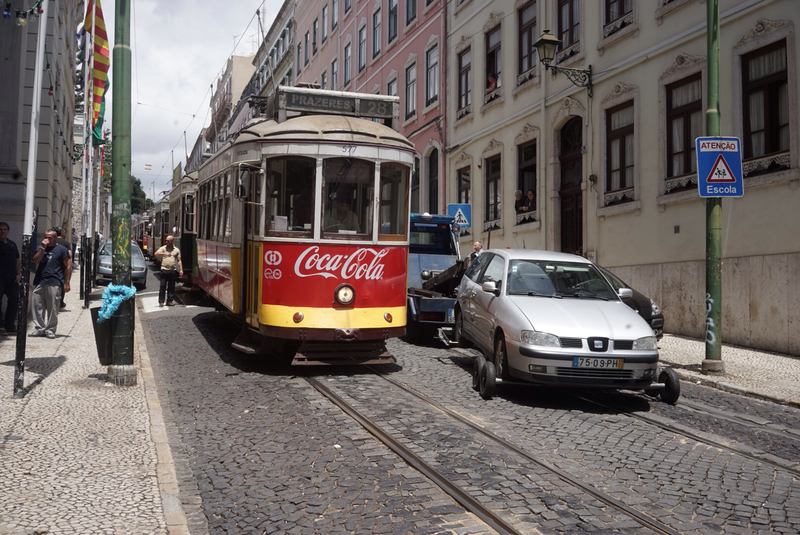 Mind you, the tram in question is probably the most famous icon in Lisbon, the no. 28 tram. It’s not one tram, but a group of old wooden rattlers that snake their way up and through the labyrinth of narrow roads and sharp inclines, with impossibly beautiful vista’s all around. 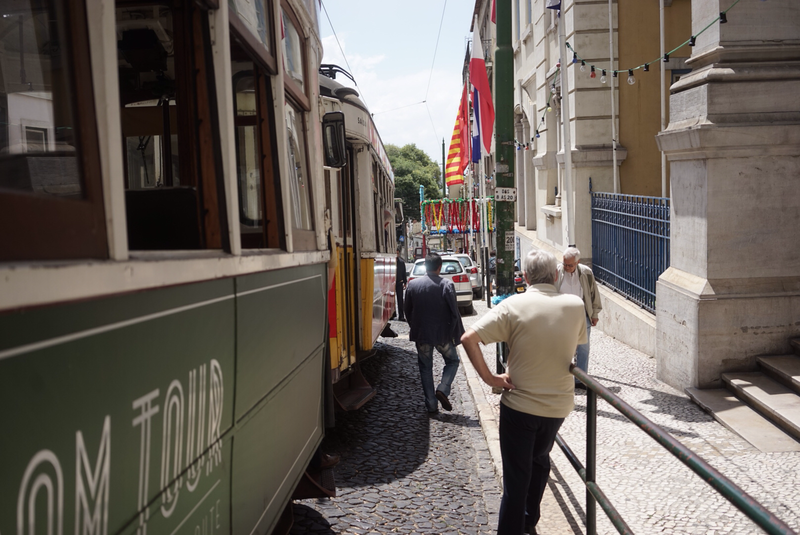 Naturally, we walked to the highest point, through the Alfama & Graça districts, for those who may know those, and jumped on the tram at the starting point high over Lisbon. These trams are very, very popular and therefore normally packed, so imagine our excitement to get on one…and get a seat!! The trams leave every 10 minutes or so, and ours slowly creaked off down the hill on the start of our journey…..then ground to a halt 100 metres later! I’ve mentioned the narrow streets, haven’t I?? Well, some bright spark had parked his car and not left enough room for the tram to get past! And ‘cos last time I checked trams can’t divert off the tracks, we were stuck until the driver came back. One other thing famous about the no 28 tram is the distinctive bell they ring to get the attention of any wayward pedestrian, or car. Well, we certainly heard the bell!! Unfortunately, the driver of parked car didn’t, and slowly another tram backed up behind us, and another, and another…. After about five trams started an enforced ‘siesta’, we bailed, and headed in the other direction to catch a tram. Problem was, the whole network seemed to have ground to a halt, so after about an hour, we headed back to see if the situation had improved, to find the offending car being towed, finally!! 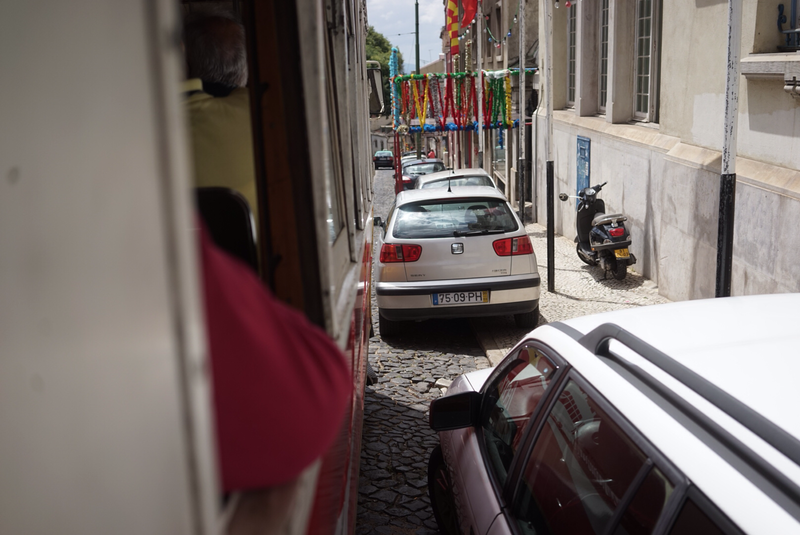 Narrow streets, one idiot, and the tram system grinds to a halt. 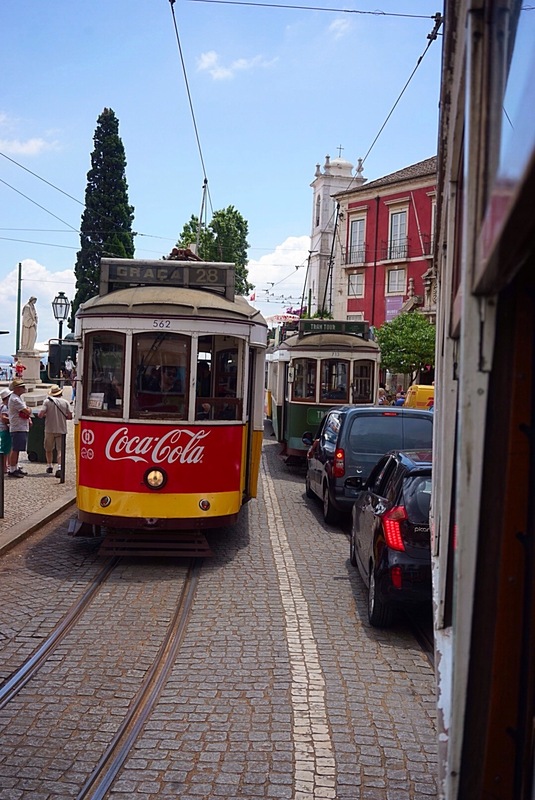 We jumped on about the third tram in the gridlock, got a seat….again, and settled in for a great trip through Lisbon. It may be a bit naff, but we had a great time as the tram lurched and shrieked, bounced and rolled and peeled it’s bell through the city, up and down hills and through both wide boulevards and narrow lanes. It finished outside the old cemetery next to the Lisbon cathedral. And next to another market, so in we went for a late lunch. 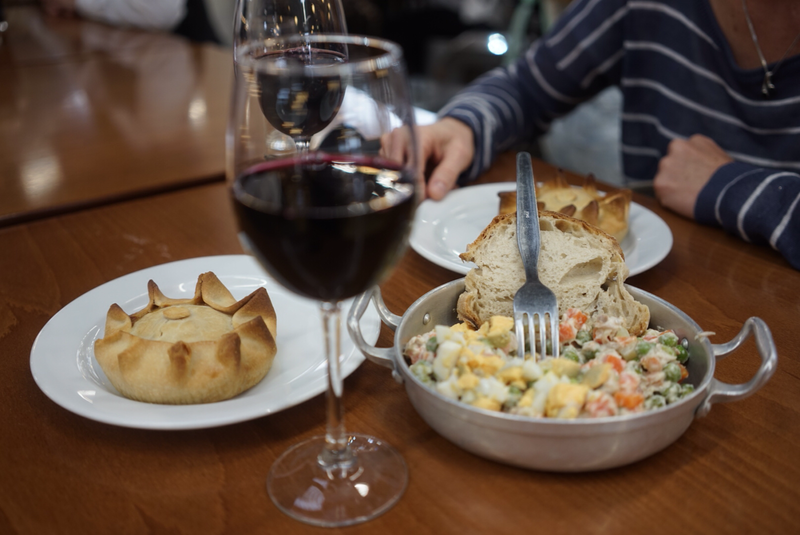 These markets are great, offering a wide variety of foods and drinks, of which we partook in empanadas and a glass of red, as well as a salad. Yep…a salad!! With green bits in it! Not many veggies consumed on this holiday yet. We caught the tram back to the Bairro Alto region, and checked out the ruins of the old convent, the Church of Santa Maria do Carmo, wrecked in the earthquake of 1755 and only partially rebuilt. 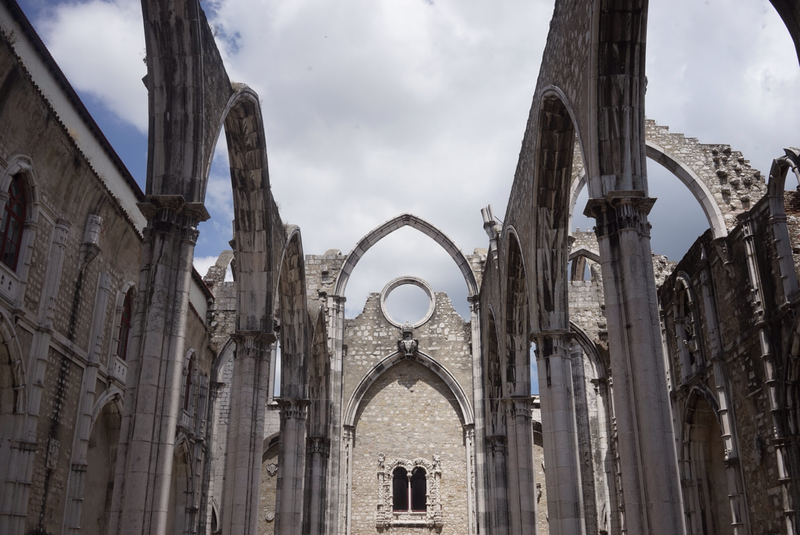 The 1755 earthquake destroyed much of Lisbon, and this is just one reminder of the distruction wrought upon the city. The ruins were very atmospheric, offering a glimpse into another time. More wandering, a bit of shopping, sightseeing stuff, then back to our apartment for a ‘legs up’. We decided to eat in, as the wallet was shrinking, so grabbed chicken and salad (again!) and a bottle of vino, settled in with a tune or two on the turntable. A quick night trip up the hill on the tram, and a stroll back down, and we were done. It’s been a tough few days on the go! 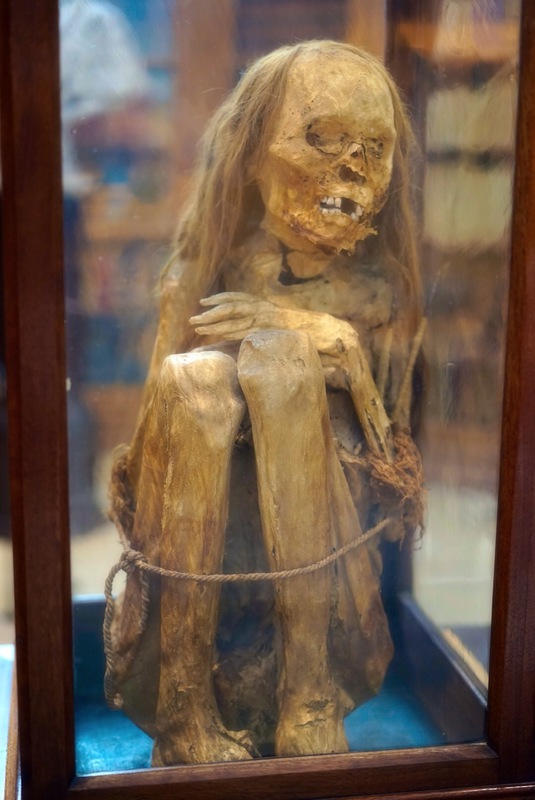 Seems to have aged me somewhat? Look what happens when Rachael’s sugar levels drop!! !